Wow! This book had me from the first paragraph. It would be scary enough to be left in a place you’re not really familiar with, but on top of that his brother never comes back to get him. 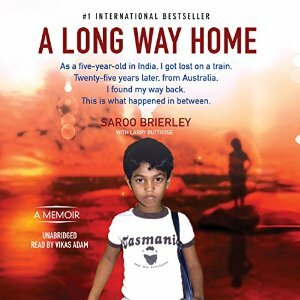 He can’t tell anyone anything that will help them find his family, and then he sets out on a journey that was scary for me as a reader, so I can’t even imagine what it was like for Saroo at the age of 5. Finally, after one horrible experience after another, Saroo is taken to a place where people help him find a family that wants to adopt him. Now, although he’s safe with people who care for him, he still has memories of his mom, brothers and sister, and wonders how they are, if they are looking for him, and if he’ll ever see them again. Although he adjusts really well with his new family, those thoughts never leave him and he starts another journey to see if he can find them. Finally, he does and takes a trip back to India and sees his birth mom and siblings. This is one of those books that I didn’t want to stop listening to for even a minute. I clung to every word, wanting to hear what happened next. The book is narrated by Vikas Adam, and he did a great job. Very easy to listen too. I absolutely loved this book and can’t wait to see the movie The Lion (hopefully tomorrow) based on the book. If you haven’t read this yet, I 100% recommend it! I thought that sounded a lot like The Lion. I had no idea there was a book. I want to read the book and see the movie now. I’ve seen this book but hadn’t seen any reviews so I was glad to see yours! The premise grabbed me but I worried that if wasn’t well done it’d be painful. Now it sounds like a must read! Happy Monday, Vicki! I enjoyed your excellent, enthusiastic review. I’d love to read or listen to this book. I also want to see the movie, soon! What an amazing, true story! I WANT to read this book. You gave a wonderful review!! Oh so many books!! Vicki, we just went to see, The Lion yesterday and loved it. Such a wonderful but emotional story. Sounds like an incredible story! I really liked the movie Lion and now want to go back and read the book. I hope you got to see the movie. Cheers.